The Old Bailey is the Central Criminal Court of England and Wales. In my Gender, Crime, and Justice module at City University London, I have learned extensively about the criminal system (whether it be domestic abuse, homicide, or any other crime and how it is handled) here in the United Kingdom. As a visitor to London (from the United States), it was interesting to hear about the many similarities and differences between the British and American law systems. 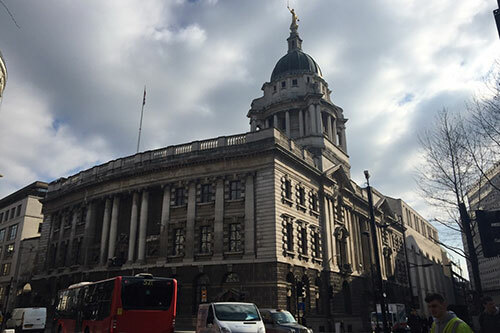 To extend my understanding, I took a trip to the Central Criminal Court of London (also known as the Old Bailey) to learn first-hand about law in the United Kingdom. The first thing I was exposed to was the high security. Nothing (and I mean nothing) was allowed inside. I ended up having to drop my bag and mobile phone off at a nearby store that allowed me to keep my bag there for a fee. From my experiences at a county circuit court in the USA, we also have security but not to the extent of forbidding bags and phones. After passing through security, I spoke to staff members about which courts were in session. I found a courtroom that was currently conducting trial so I snuck in there quietly. Since the trial is ongoing, I am not allowed to discuss it, but I did observe many things just about the courtroom itself. The most unusual thing I observed was the wigs! All of the lawyers (barristers) and judges wore these wigs which I found out was more about tradition than anything else (still so interesting!). In the USA, the only one wearing a robe would be the judge, and the lawyers would just be in business attire. I also found it interesting that the public gallery was just that – a gallery like a mezzanine or balcony in which we had to look down to watch everything. I felt like I was at a theatre or show. In the USA, the public gallery is on the same floor as the rest of the courtroom. The witness testifying stood up at a podium while the barristers questioning them just stood up from their long table and sorted through papers containing pertinent information. In the USA, the witnesses would sit near the judge, and the barristers would step forward to question them. Also, the defendant would be sitting next to their attorney, but this defendant was placed behind a glassed area at the back of the court room. Although I cannot give information about the specific trial, it was extremely interesting and I hope to access the results of it somehow. The experience all in all was very rewarding. I learned so much about London and the British criminal system. It was also very exciting to see how things actually play out versus just hearing about them in the classroom (although my lecturers do a great job of explaining everything). I am glad I was able to visit the Old Bailey, and now I am excited more than ever to continue my criminology module at City!